AP SGPCET written Exam will be conducted on 15-03-2019. 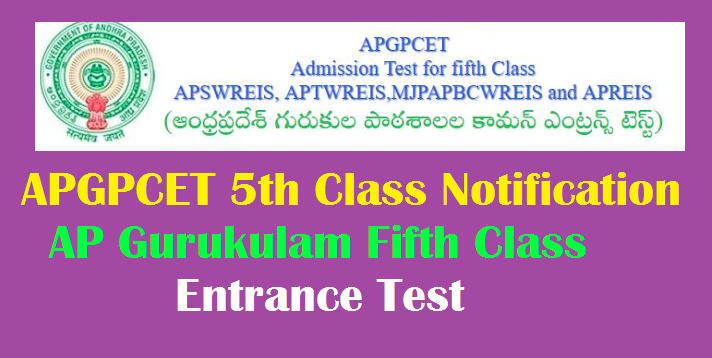 For More Details Like AP Gurukula Pataashala admissions 5th class application form, last date for apply, application fee, eligibility criteria, selection process, exam pattern, hall tickets, results previous papers are given Below on https://apgpcet.apcfss.in/Fifth/. e)The students are eligible to apply for admission in their native district only. f) The Native District of the candidate means the place where the student studied either in Class 3rd or 4th or both in schools recognized by Govt .of A.P. or native place as certified by the competent authority. • Based on the Entrance Test. • Selected candidates will get admission through counseling. • The student should clearly mention the school in which he/she wants to join i.e., APSWR / APTWR / APREIS / MJPAPBCWR while submitting the application. • There is no registration fee for submission of application. • The student should mention clearly the school opted in the on line application through online. • Take printout of the application for future use.